Villaraigosa and other leaders look on as Barbara Boxer announces $543 million in loans for the Crenshaw Line. Because of the loan, the Crenshaw Line was referred to as the "first 30/10 project." Yesterday, The Senate Environment and Public Works Committee released an outline of some its core principles for a federal transportation reauthorization bill. One of the main planks of their proposed program would be expanding the TIFIA loan program from a $110 million program to a $1 billion program and re-branding the program “America Fast Forward.” The policy statement was signed by committee leadership from the Republican and Democrat side of the aisle, including California Senator Barbara Boxer. TIFIA is currently funded at $110 million a year but demand has far outstripped the availability of loans. Boxer’s committee is proposing to increase that funding nine-fold, to $1 billion a year. She says that amount could leverage $30 billion a year in private investment. They also plan to increase the maximum federal share from 33 percent to 49 percent, with even more favorable terms for rural areas. The TIFIA program will keep its name but be folded into a new, larger program called America Fast Forward. While inclusion in a proposed piece of federal legislation is doesn’t assure anything in Washington, D.C., this news does make one thing official. The vision of Move L.A. to accelerate transit programs for areas willing to spend their own money to build them, a program that was championed by L.A. Mayor Antonio Villaraigosa, has evolved from a local “good idea” to a national policy initiative. In 2008, L.A. County passed a sales tax to fund transit projects over the next thirty years. Unhappy with that timeline, a coalition of activists, politicians and labor leaders created the 30/10 initiative to create a federal loan program that would speed up the funding and construction of these programs. The program was re-branded America Fast Forward earlier this year in an attempt to show the national benefit of changing the way the government funds and loans funds for transit programs. But the idea and movement started here. Following the release from the Senate Committee yesterday, Villaraigosa was in the mood to celebrate. “The legislation now being drafted will create a new section named after our program – America Fast Forward – which will strengthen the Transportation Infrastructure Finance and Innovation Act (TIFIA) to leverage billions of federal dollars more effectively so cities and states can access capital and get it out to Main Street America quicker to create jobs now,” the Mayor wrote in a press release. Always the strategists, Move L.A. noted that the bi-partisan statement was a strong sign that perhaps the logjam on transportation issues was coming to an end. 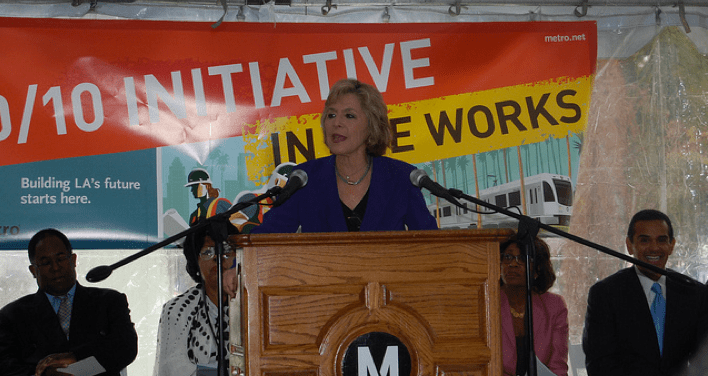 “At Move LA are we are very pleased that a bi-partisan group of four Senators with very different political views have come together in a difficult political environment to support investment in transportation infrastructure,” said Move LA Executive Director Denny Zane. Is $1B per year enough? That seams really, really low. LA, just one city, needs to borrow almost 30 billion in 10 years. This is just the start, but very exciting progress nonetheless! The Mica Bill: Good for 30/10, Bad for Everyone Else. How Will Boxer Respond?